I heard yesterday (Saturday) was going to be really hot, so I thought it would be cool (pun intended) to hide inside the earth for a bit. Near Mt. 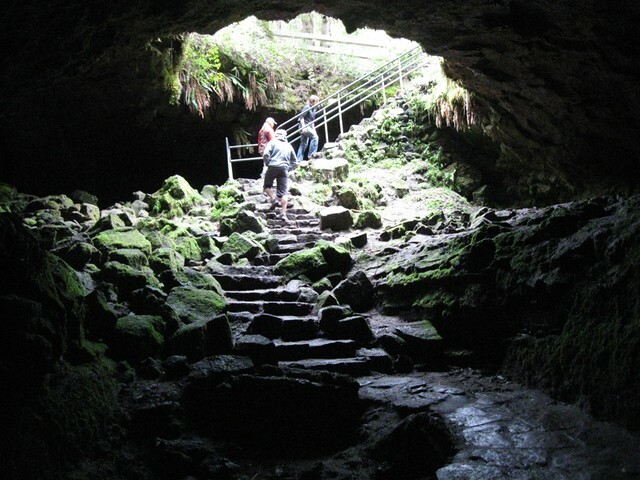 St. Helens, Washington, there’s this part of the park called Ape Caves, which is a former lava tube. (Used under creative commons, thanks iwona_kellie! As we began our descent into the cave, there are a couple things you notice: a stark change in temperature – from 90°(f) to the average temp inside the cave of 45°(f) – and there’s a really interesting breeze blowing through. Immediately, you’re struck with a decision. A decision you have to make quickly because if the cave is busy there’s many people behind you, pushing their way in. Your two choices are this: Take the lower (or easier) cave or take the upper (harder) cave. In “life+art=reality” and in spelunking, we took the more challenging road. As you make your choice and walk further into the cave. You lose all sense of perception as your mind, and optical nerves, adjust to the reality of complete darkness. The cave walls seem to absorb all extra noise and soon you find yourself in a weird, yet comfortable, sensory perception deprivation state. It’s blissful, almost, you’re now on your journey, flashlights in hand and ready to climb throughout this former volcanic river. Then the real “climb” begins. As you’re walking into (or out of) the cave, you have to climb and scurry around, having chosen the more difficult path. Over large boulders of rock that once floated through the canyon, watching your head for low hanging objects, squeezing through tight spaces requiring you to use your mind and body in unison to get through a difficult pass. Inside each pathway, I noticed there were almost always two decisions, two routes to take, the more difficult and challenging (or sometimes impossible) route and the relatively simple, well-traversed route. Many times you didn’t know the outcome of your choice until you took that first step. Then, it was too late to go back and start over. Placing your feet in the correct spot was one of the more challenging tests. Each rock was either: solid and stable, shifted slightly, or was completely rickety. The problem was, no matter how many ways you tested it with your toes, you really didn’t know which state that rock was in until you put your full weight onto it. Much like life, you never know the outcome of something, unless you give it your all. Having scurried through the cave; I did not fall once. I doubted myself many times; but, I did not fall. I have some bruises, sore muscles, and reminders of low-hanging stalactites. But, every step I took turned out, in the end, to get me to my destination. I never considered turning around. I kept putting one foot, in front of, or high above, the other. My spelunking partner and I made sure to support each other in each difficult pass, every challenging route, and every moment of rest, including moments to stop and look around at the cave’s beauty. The toughest challenge was wall-walking. If you’ve seen someone rappel down the side of a cliff or mountain then you’ve seen someone do this before. You grab the rope, lean all of your body weight into your legs, and walk up the wall. Yesterday was my first experience with this. There’s a part of the path which used to be a lava-waterfall and it is only about ten feet tall, but it’s still challenging to climb. Having examined the wall, I noted it’s cover of cave-slime, instantly you’re nervous about placing your feet on the wall, afraid of slipping. Up I went. I grabbed the rope firmly, leaned back, took a deep breath, placed my feet on the wall, and pulled myself up. The adrenaline kicked in and I went for it! Up the wall I climbed, over the edge and sure-footed on the top. A challenge overcome. There were a couple places in the cave, where the groups bunched up, waiting for the last climber in their team to navigate the pass. As with life, there’s always one or two people who are impatient or unwilling to wait for someone else. There were a few of those inconsiderate people in this cave, trying to climb over/around others to get through faster. Luckily peer pressure, in this case, succeeded in forcing them to back off and wait their turn. As we rounded a corner, we started to see light. Which gave us hope. Nearing the end, (or so we thought,) spirits lifted, we walked a little faster, and started looking around. Only to find out, it was a skylight. A place where the cave had collapsed the roof, giving us only a small peek into the outside world. We pressed on, undeterred, and made it through to the end. Climbed out of the cave and made the hike back to the car in blue skies and beautiful weather. Challenging as the hike was, the reward was really worth it. A day spent with a friend, pushing myself to new limits, understanding what I’m fully capable of: climbing a wall of slime, seeing how nature survives in darkness, and coming through the other side. All these things, I think, we deal with in real life, I just don’t think we take enough time to celebrate the successes. In that cave, especially in the extreme darkness, I felt great fear. No cellphone service, no light (except from our flashlights,) fear of bats(!) and virtually no sounds (except for our breathing.) Well worth the experience. While I never intended, when we set out yesterday, to come back with a fable of cave dwelling and it’s application to real life. There are so many connections to be made here: People climbing over you to get ahead, feeling alone in large caverns, being unsure of your footing and pushing yourself to do things outside your comfort. Job well done! Very cool. I really must get out there one of these days! Thanks. It’s really pretty awesome.